As the United Nations, encouraged by the US Administration, presses on with advancing abortion across the globe as a form of family planning - and even a human right - not all countries have embraced this practice. 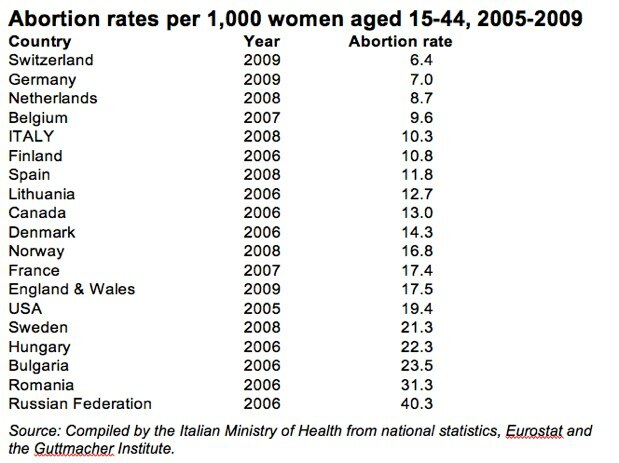 As reported in MercatorNet last year, one major country that is turning away from abortion is Italy. Abortion numbers and rates there have continued on a downward trend for over two decades. The recently released 2009 report on abortion - which the Ministry of Health presents to Parliament each year - confirms another drop in the number of abortions and in the abortion rate. Abortion, which was legalized in Italy in 1978, reached a peak of 234,801 cases in 1982. In 2009, 116,933 abortions were performed, a decline of 3.6 percent from the previous year - a figure that for the first time was less than half the number in the peak year. The numbers have declined consistently for the last five years. Observing a divergence in trends, since the mid 1990s the Ministry of Health began disaggregating data to show abortions by both Italian and foreign women in Italy. The abortion rate for foreign women alone has continued to rise since data commenced, and for 2008, the latest data available, foreign women accounted for 33 percent of all abortions in Italy, compared with 10 percent in 1998. Were it not for the foreigners, Italy's abortion total and abortion rate would be even lower. Compared with 1982, the number of Italian women having recourse to abortion dropped by nearly two-thirds - by 65.2 percent to be exact! The growing number of foreign women resorting to abortion has been attributed to increased immigration, failed contraception practices, and looser attitudes towards terminating a pregnancy held by women from foreign countries especially by Eastern Europeans who accounted for 52 percent of non-Italian abortions. In 2009, foreigners comprised 7 percent of Italy's resident population of 60.3 million. The Ministry of Health report does not present any analysis as this is outside its competence, but does make a passing reference to "socio-cultural issues." From other sources, it can be observed that in Italy the concept of the traditional family remains strong (divorce rates are lower as are out of wedlock births compared with the rest of the European Union), religious practice is higher than in many other European countries and, unlike many northern European countries, secularism and relativism are not widespread in Italy. The Catholic Church is still influential in shaping morals. Finally, Italians do celebrate life in faith, music, art, and traditions - and a sense of caritas prevails. Professional and non-professional women struggle to cope with practices that are not sanctioned in other developed countries. For example, the prospect of pregnancy - as in the case of a newly married woman who "might" get pregnant - could result in that woman being laid off. Some employers discriminate by letting women go after they return from maternity leave - which is granted by law for 20 weeks - simply because they may feel that a woman with a newborn at home could not be as attentive and productive as previously. This is very different from the United States where the 1978 Pregnancy Discrimination Act provides that women cannot be fired or denied employment or promotions due to pregnancy.